Sipsey Street Irregulars: Keep talking, you collectivist tyrant. Between you and ISIS we ought to have a real run of record firearm sales in 2016. Keep talking, you collectivist tyrant. Between you and ISIS we ought to have a real run of record firearm sales in 2016. "Obama says gun control to be top issue of final year." Written by Mike Gallagher . President Obama : This is why you didn’t go to France. It was you who gave $100 million in U.S. taxpayer funds to re-build foreign mosques . It was you who bowed in submission before the Saudi King. It was you who sat for 20 years in a Liberation Theology Church condemning Christianity and professing Marxism . It was you who exempted Muslims from penalties under ObamaCare that the rest of us have to pay. It was you who purposefully omitted – “endowed by our Creator” – from your recitation of The Declaration Of Independence. It was you who mocked the Bible and Jesus Christ’s Sermon On The Mount while repeatedly referring to the ‘HOLY’ Quran . It was you who traveled the Islamic world denigrating the United States Of America. It was you who instantly threw the support of your administration behind the building of the Ground Zero Victory mosque overlooking the hallowed crater of the World Trade Center . It was you who refused to attend the National Prayer Breakfast, but hastened to host an Islamic prayer breakfast at the WH. It was you who ordered both Georgetown Univ . and Notre Dame to shroud all vestiges of Jesus Christ BEFORE you would agree to go there to speak, but in contrast, you have NEVER requested that the mosques you have visited adjust their decor . It was you who appointed anti-Christian fanatics to your Czar Corps. It was you who appointed rabid Islamists to Homeland Security. It was you who said that NASA’ s “foremost mission” was an outreach to Muslim communities. It was you who as an Illinois Senator were the ONLY individual who would speak in favor of infanticide . It was you who were the first President not to give a Christmas Greeting from the WH, and went so far as to hang photos of Chairman Mao on the WH tree. It was you who curtailed the military tribunals of all Islamic terrorists. It was you who refused to condemn the Ft . Hood killer as an Islamic terrorist. It is you who has refused to speak-out concerning the horrific executions of women throughout the Muslim culture, but yet, have submitted Arizona to the UN for investigation of hypothetical human-rights abuses. It was you who when queried in India refused to acknowledge the true extent of radical global Jihadists , and instead profusely praised Islam in a country that is 82% Hindu and the victim of numerous Islamic terrorists assaults. It was you who funneled $900 Million in U.S. taxpayer dollars to Hamas . It was you who ordered the USPS to honor the MUSLIM holiday with a new commemorative stamp. It was you who directed our UK Embassy to conduct outreach to help “empower” the British Muslim community. It was you who embraced the fanatical Muslim Brotherhood in your quest to overthrow the Egyptian President, Hosni Mubarak . It was you who funded mandatory Arabic language and culture studies in Grammar schools across our country. It is you who follows the Muslim custom of not wearing any form of jewelry during Ramadan . It is you who departs for Hawaii over the Christmas season so as to avoid past criticism for NOT participating in seasonal WH religious events—while keeping all those who have to travel and protect you from spending the season with their families. It was you who was un -characteristically quick to join the chorus of the Muslim Brotherhood to depose Egypt’ s Hosni Mubarak , formerly America’ s strongest ally in North Africa; but, remain muted in your non-response to the Brotherhood led slaughter of Egyptian Christians. Obozo should be thankful that after 48 hours or so the public's attention moves on to the nest distraction. Those are the mindless simpletons that vote for a narcissistic, delusional, "cult-of-personality" madman like him..
No coincidence, Mike. When I read that article yesterday I had the same reaction- "Here comes another spike in gun sales, thanks to the Salesman of the Decade". I better buy that Blackhawk I've been thinking about just to show my support. And regarding the Bamster complaining about people having short memories, that's a laugh. He and every member of his traitorous, destructive, collectivist Democrat Party count on it. Every single word this guy says is either twisted manipulation or an outright lie. Allegheny County, Pennsylvania (which includes Pittsburgh) saw a huge increase in License to Carry Firearms applications due to the events in Paris, France (not to be confused with Paris, Texas). Roughly one in ten Pennsylvanians are now licensed to carry concealed, and open carry requires no license at all, and is legal statewide. This should make the Moonies happy. A simply outstanding example of The Law Of Unintended Consequences. I rather doubt that Obama or anyone around him thought for a minute that his actions would directly lead to the unbelievable spikes in firearm, ammo and accessory sales. I remember seeing a series of pics showing displays in a gun shop right after the CT shooting. After a short time, nearly everything that would fire a projectile was gone. And as it has been said - very few people are spending all that money on guns and ammo so that they can turn it all in if a law is passed. 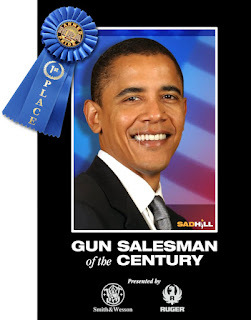 The enduring legacy of Barack Obama - millions of firearms moved from dealers to citizens. He's the best thing that's happened to shooters since non-corrosive primers. Does he find it humorous that his actions cause the creation of millions of new gun enthusiasts? A thinking man would finally learn to shut up when he saw that EVERY TIME HE OPENED HIS MOUTH, HIS ARMED ADVERSARIES INCREASED IN NUMBER! Did any one ever consider the idea that maybe "they" want it that way? That they can't wait till some of us use those guns and give them the excuse for which they so dearly wish? Or that we poor balkanized former Americans, parted along every imaginable fault line, commence to fighting amongst ourselves over the scraaps from their table? The NWO folks who call Obummer's tune would find that most to their purpose. Not to say that it would work out as they hope but it will take a monumental effort spiritually, intellectually and physically on our part to deny them.